You might not care who can access your data because you have nothing to hide. But you should care, because corporations are using your data to control your decisions. As millions of consumers carry on unaware, powerful corporations race to collect more and more data about our behaviors, needs and desires. This massive trove of data is a valuable business asset and one that milks consumers as the supply chain but gives them little control over how it's collected and used. 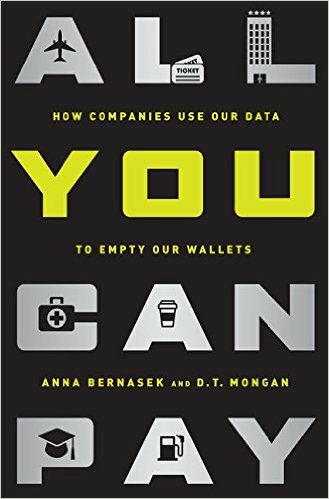 In All You Can Pay: How Companies Use Our Data to Empty Our Wallets, Anna Bernasek and D. T. Mongan write about how companies use what they know about you to determine how much you are willing to pay for everything you buy. From college tuition to plane tickets to groceries to medicine, companies already set varying prices based on intimate knowledge of individual wants and purchasing power. Rapidly changing (dynamic) pricing and complex offers tailored to each individual are the stuff of the analytics driven free market. Data giants know everything about us before we enter stores or open our browsers. We may think that the Internet lets us find the best deals, but the extensive information companies have about us means that the price we see tends toward the maximum they know we can, or will, pay. In a momentous shift, the economics of information has turned our economy on its head and the concept of fair bargaining is almost history. Bernasek writes the Datapoints column for the New York Times and is a writer for Newsweek. She has covered economics and business as a journalist and author for more than 20 years, in Fortune, Time, the Sydney Morning Herald and the Australian Financial Review. Mongan—Bernasek's spouse—is a lawyer based in New York specializing in finance and corporate transactions.